Hosting the screen pop program on a valid HTTP server to handle screen pop for inbound/outbound interactions. In the example discussed below, we display the call-related parameters posted during screen pop. From the choice of Target CRMs listed, select Custom. Note: If your CRM is not listed in the target CRMs on this page, select Custom. For more details on screen pop parameters for inbound calls, click under the logout button in Configuration Manager. Select the Open new window for screen pop check box to specify the screen pop window size and position (optional). Learn more about how to control properties of a screen pop window. Refer to the respective external CRM Integration - Configuration Guide for detailed instructions on setting up the integration. You can log in to Agent Console as an agent, and view all available parameters passed to the custom CRM as an HTTP POST message. 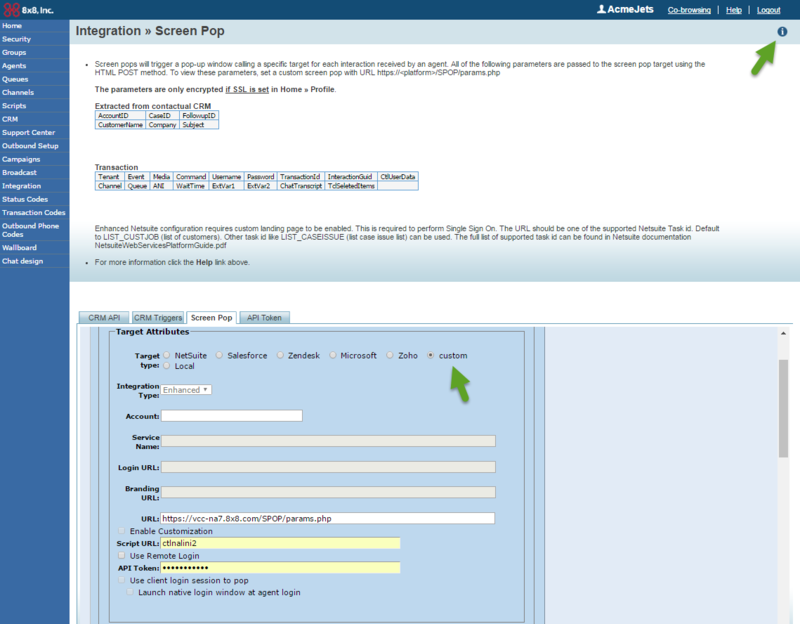 The new screen pop is triggered based on events (offered, accepted, or completed) selected in Configuration Manager. Notice the event parameter. In this example, the screen pop occurs when an event (which matches the selected option in Configuration Manager) is Offered to an agent. Notice the ANI parameter. This can be used to look up a relevant record in a Custom CRM to return a URL for screen pop. Click here for another example of a screen pop program.